To demonstrate how electrification can change the world, such as through tackling climate change and reducing air pollution, Danfoss Editron, which manufactures hybrid and full-electric drivetrains, will present systems featuring the market’s highest total efficiency levels, meaning fewer batteries in full-electric vehicles and lower fuel consumption in hybrid drivetrains. The company will also showcase its dedicated Editron marine system. The software enables one piece of hardware to perform the task of several components, and enables each system to adapt and upgrade as the user’s requirements evolve. The extremely compact and lightweight design of the drivetrains also saves space, guaranteeing less noise and greater comfort compared with traditional hydraulic models. 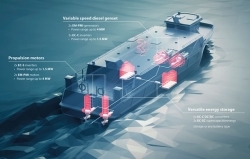 Danfoss Editron hybrid-electric propulsion powers the Stockholm shipping company Waxholmsbolaget’s first hybrid ice-going passenger ferry, a recently launched 27.5m vessel.